This entry was posted on November 28, 2008 by Phil Groom, in News and tagged Books for Children, Environment, Pollution. Bookmark the permalink. 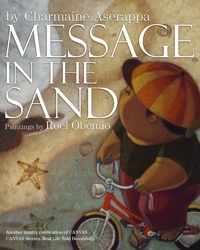 I can think of no more powerful and no more appropriate follow up to my Think Green: Shop Local post than the message of Charmaine Aserappa’s book, Message in the Sand, introduced here by Charmaine last month and, I’m delighted to say, finally published in the Philippines yesterday. I’ll post UK availability details when I have them. For me, it brings to mind the story of Jesus, writing whatever it was he wrote on the ground when the religious leaders of his day, convinced of their own righteousness, tried to force him to condemn a woman who’d been caught out. Messages in the sand may be washed away by the tide or by time: but their power transforms lives, and has the potential to transform our world — if we let it. Read or listen to Miguel’s story. But please don’t stop there: take its message into your heart and let it transform our world.